Two Tools running at the same time on One 30 AMP 240V Circuit, Possible? I’ve been doing some research and have seen some different answers but nothing about my specific situation. I’m sure its out there, just couldn’t find it in the past few days. I have two tools that use 240V. One is my dust collector, a Grizzly G1029Z2P and an Axiom AR8 Pro+ CNC machine. 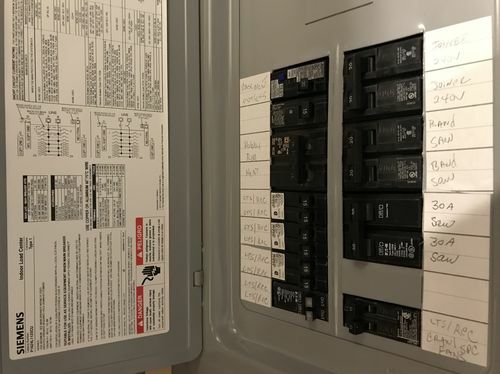 If my breaker is 30AMP (wiring is 10/3 gauge), is it safe to run both tools at the same time? At 80% its 24 amps. I’m hearing that if I change my plugs to match 30 AMP outlets and have both machines running that they could pull more amps than they are designed for if there was a problem and NOT trip the breaker, ruining the tool. I believe the collector recommends a 20 AMP dedicated circuit and the CNC recommends a 10 AMP dedicated circuit. They just say check with local codes for running multiple things at the same time and make sure the wiring is properly sized. Theoretically the wiring should be sufficient at 10/3. There is no way for me to have more than one 240V circuit without going through a subpanel. Which I really don’t want to do if I can avoid it. If I recall the NEC says one device per 220 volt line. Can you please clarify the above statement? Why do you say there is “no way” to have more than one? What you really don’t want to do if you can avoid it is burn your shop/house down. I’m pretty sure you can have more than one device on 240V circuits that are 20A or less, but that doesn’t help you since yours is 30A. Do it right and use a sub panel to have the proper sized circuits. Size does not matter, one device per circuit or you can be found at fault if something happens. Can you please clarify the above statement? Why do you say there is “no way” to have more than one? What you really don t want to do if you can avoid it is burn your shop/house down. The problem is I only have 4 open slots. I wanted to run a couple 120 circuits to the garage as well as the 30 Amp 240V circuit. I bought all the stuff for the job months ago, just haven’t got to it yet. I could forfeit the 120v circuits and have 2 240v, it just seems like a waste to have a 10Amp router on one by itself..but I’m not an electrician. If that’s the only safe thing to do then I’ll do it. As far as a sub panel, I guess I wanted to keep it simple. I have an older main panel, the neutral and ground bar is the same bar. I’ve read that in a sub panel the ground bar and neutral bar are separate and cannot be tied together. How would I avoid it? It would probably be ok.
Something can be safe and still not to code. Codes were written with stupid things in mind. Not really any different than using a power strip and plugging a bunch of things into it. You do need to watch inductive loads (motors) because they draw a lot more current when you first turn them on than their normal running load. Twin some of the existing 120v circuits to free up the extra spaces for the 240v breakers if you panel and local codes will allow it. Your only option to keep it safe is to put in a sub panel. Not really too big of a deal. You can probably get by with 60A. An electrician can verify your main is up to code when he adds the circuit for the sub. The sub does need separate neutral and ground within the sub panel. This prevents the sub panel from using a different ground path that have a different ground potential. So utilizing 6-3 plus ground wire for your sub panel feeder ensures the sub is grounded to the same ground source as the main. I’m not an electrician, nor do I play one on TV. Just my own research and knowledge from working in IT for too many years. In the end, hiring an electrician is money well spent. Was it explained why having two tools running at the same time, vs. 1 tool running, could cause too much power drawn if there was a problem, thus ruining the tool? Seems like this is a standard concern of having a larger breaker than the tool motor—why the CNC recommends 10 amp breaker for a 10 amp tool. My Keurig, space fridge, space heater, and little microwave all insist on a separate 15 amp breaker. Most people don’t have a 1000$ to run a new line for every 75$ appliance they buy from WalMart. Mr. TungOil hit the nail on the head…...this is the answer. I don’t know if I want to argue with these statements or not…but I will say this, in the event of a fire there will be an inspection by your insurance company. All the inspectors have to do is find a code violation and the insurer will deny the claim. I will say that when it comes to safety, you can get “safety stupid” with overdoing things real quick, but compared to some safety rules and codes, honestly from what I see, the NEC is pretty reasonable. Still, it’s hard to argue with sayings like “better safe than sorry” or “an ounce of prevention is worth a pound of cure”. Thanks for the tips and answers jocks. I’ll keep the two tool on separate circuits. And I’ll look into using one of those twin breakers. I don t know if I want to argue with these statements or not…but I will say this, in the event of a fire there will be an inspection by your insurance company. All the inspectors have to do is find a code violation and the insurer will deny the claim. I’m not arguing for intentionally violating building codes, but this statement is not true and is a bit of fear mongering. A code violation may cause a problem, but there are few older houses where there isn’t some kind of code violation present. I mean hell, there are still lots of houses using knob and tube wiring out there. An inspection revealing a code violation does not automatically mean a denied claim. Based on your comments I take it that your garage is attached to your house and the house panel is not located in the garage. Sounds to me running a 4 wire feeder from your main panel to a subpanel in the garage it the best option and gives you the flexibility to add more circuits in the garage. As suggested above running NM 6/3 with ground can get you a 240V/120V 60A subpanel. You can tell if you panel can accept twinned breakers by the diagram inside the panel. Here’s a photo of one of my sub panels where you can see that the lower breakers are twinned and what the corresponding diagram in the panel looks like. In my panel, the bottom 4 rows on either side can be twinned.